Gold Coast stuntman Gulliver Page in action for a promotional film festival. Your schedule too tight to take in scuba diving and skydiving this weekend? Why not try both at once? That is the subject of one of the entries in the ‘One Day in Paradise’ film festival promoting Tropical North Queensland, launched on May 15. Experienced filmmakers such as 2013 Tropfest Winner Nicholas Clifford are among the 20 contestants involved in the $75,000-first-prize competition. All the two-minute films from the Youtube-based festival had to be made using wearable GoPro cameras. 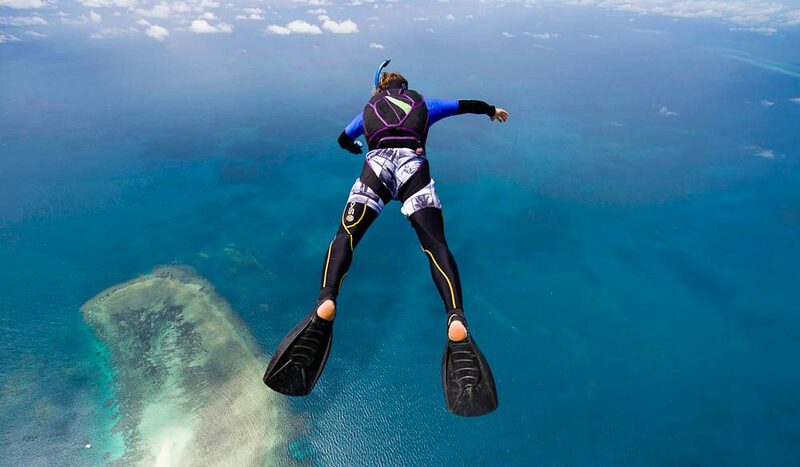 The flying frogman, Gold Coast stuntman Gulliver Page, pictured, warned that scuba-sky diving isn’t just your run-of-the-mill weekend activity. “Jumping out of a helicopter in snorkelling gear and landing on the Great Barrier Reef isn’t for everyone, but it’s certainly a novel way to experience this beautiful part of the world,” he said. Other experiences captured in the promotional festival include a gymnastics display in the Daintree National Park and a bull riding youngster sporting a helmet-mounted GoPro. One Day in Paradise will be judged in June by a panel including former Tropfest judge and SBS film journalist Sandy George.